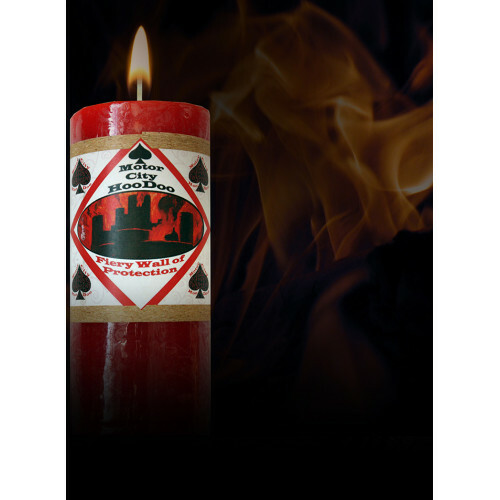 Fiery yellow-orange candle with an earthy pepperminty scent. 2 x 4 pillar burns for 40 hours. Protection from the evil, harmful thoughts and actions of others. Thieves, cons, gossips, predators and jerks beware! Use a clean sheet of paper to write your name. Now draw three concentric circles around your name and write around the circle, "Fiery Wall of Protection." Place this under your candleholder. Burn this candle a little everyday until it is done. 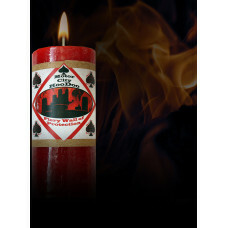 A shadow black candle with a green spicy scent 2 x4 pillar with a 40 hour burn time. From without an..